When you first log in to the Kickstarter app, notice that the default option at the top of the app page is Staff Picks, meaning the staff-picked projects of the day will appear on the main page. Along the bottom are three additional icons: Discover, Activity, and Profile. If you’ve started setting up your campaign on the Kickstarter website, you also see a dashboard icon. By default, the Discover icon is selected, meaning that you’re in the part of the app that’s designed for discovering Kickstarter projects. Staff Picks: You can swipe through a list of staff project picks. Popular: Scroll through a list of popular projects in this area. Starred: If you find a project you like, you can give it a star by tapping the project and then tapping the star icon that appears at the lower left. Search: To search for a project by name, use this search tool. 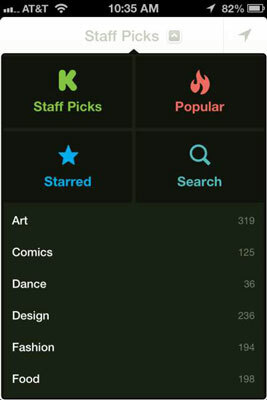 If you have a live Kickstarter campaign, check out how it looks in the app by searching for your campaign by name. Categories: Below the four tiles at the top, you see a list of Kickstarter project categories. Tap a category to browse projects within that category. 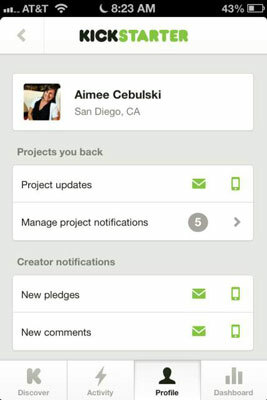 The Kickstarter app for iPhone also allows you to follow a friend or back a project. On the main page of the app, you will see a small icon that looks like a lightning bolt labeled Activity. This is separate from the activity of your own Kickstarter campaign that you see in your dashboard. Tap the Activity icon and you see a list — either of projects you’ve already backed or of friends’ projects you’ve starred to indicate that you’d like to follow the campaigns’ progress. Tap the name of the project you’d like to look at and you can see the current funds raised towards the project’s goal, number of backers, and days left. If the campaign’s creator has posted updates, those are visible here as well. If you’ve already backed a project, you will see all the available updates. If you have not backed a project and are simply following its progress, you will see only the updates the campaign owner has labeled as Visible to Everyone. When you tap the icon that says Profile, you will see options for both Messages and Settings. The Messages function of your profile acts basically like a private e-mail box; these are not public like a Facebook or Twitter posting. You can send and receive messages to individual backers of your project or campaign owners of projects you’re interested in. This location is where you will also get messages from the owners of campaigns you’ve already backed. These messages are different from the Updates you receive from a backer. If you’ve backed a campaign and the campaign’s owner posts an update for all backers to see, you’ll see it as an alert in your Activity page. Under the Settings icon, you can select how you choose to be updated on various aspects of your Kickstarter account. You will see three different parts of your account: Projects You Back, Creator Notifications, and Social Notifications. Next to each category, you see an icon for an envelope and a mobile device. This allows you to decide whether you would like to be e-mailed about activity and have updates viewable in the mobile app. The Social Notifications icon allows you to get an alert if one of your friends on Facebook has launched a Kickstarter project; you can then view the project and decide if you would like to back it.